Ammonia is produced in the fertilizer industry. The amount of ammonia inhaled by employees of a urea manufacturing industry is very high. It would be interesting to study whether such an amount has any impact on the employees working there for many years. This study explores the magnitude of respiratory morbidity among employees of a urea manufacturing industry and to establish its association with exposure to ammonia. Data was collected related to significant respiratory illnesses of all the employees over a period of 10 years using computer-based medical record system of the industry's hospital. The results obtained from the data analysis showed that there is no cause and effect relationship between exposure to ammonia and respiratory morbidity. Thus it was advised to the medical authority at industry to go for mass treatment with anthelmintics and that all the employees should be screened for specific allergens and this information should be used while managing respiratory morbidity. Ammonia is a colorless gas at atmospheric pressure which is produced in the fertilizer industry using Haber-Bosch process. Assuming that the amount of air breathed by an individual per day is 20 m 3 , the amount of ammonia inhaled by employees of a urea manufacturing industry comes out to be very high. It would be interesting to study whether such an amount in environment has any impact on the employees who have been working there for years together. The plant which is the second largest seller of urea in India  has a meticulous medical record of the employees. This is an ISO 9002 and ISO 14001 certified industry with a variety of welfare schemes attached with employees. Any illness to any of the employee is first reported to the industry's hospital. An advanced computer-based data management system has been in operation since many years which identifies all the employees with a unique ID. Although industries are required to spend substantial amounts of capital in efforts to protect their workers, occupationally related respiratory diseases continue to occur. Silverman  studied seven human males exposed to ammonia at 350,000 μg/m 3 and reported an impairment of respiration and nose and throat irritation; Jacobs  noted that ammonia inhalation mainly affects upper respiratory tract; and Friberg  noted that there was an inhibition of cilia activity at concentrations above 210,000 μg/m 3 ; these observations have implications in terms of access to unpolluted areas while working in ammonia polluted sites. The exact magnitude of the problem is unknown; however there is no question that for such a large number of people potentially at risk of developing serious respiratory diseases for which environmental causes are suspected. To explore the magnitude of respiratory morbidity among employees of a urea manufacturing industry. To establish association between exposure to ammonia and occurrence of respiratory morbidity and suggest measures for managing important respiratory conditions in industry. Study design: Secondary data analysis. Study population: All 1,221 employees of one of the largest urea manufacturing plant of Southeast Asia located in western part of India. Sample size: All 1221 employees. Data collection: The industry under study has its own computer-based medical record system. Data related to significant respiratory illnesses of all the employees have been complied and analyzed using EPI-INFO software. Few information has been obtained from the human resources department of the company. Exposure: Any employee who has been exposed to ammonia containing environment for any length of time has been labeled as an employee "exposed to ammonia". Those employees who have never been in contact with such environment have been identified as nonexposed employees. Although the data have been compiled for last 10 years, the employees have been under exposure for a period ranging from 11 to 30 years. Outcome: Diagnosis recorded for respiratory illnesses like eosinophilia, bronchitis, asthma, specific microbial infections, and chemical inhalations in individual employee's record by industry's medical officer. Statistics used: Descriptive statistics, relative risk (9 5% confidence interval), attributable risk, and Chi-square test. Present study showed annual incidence of bronchitis as 0.71%. 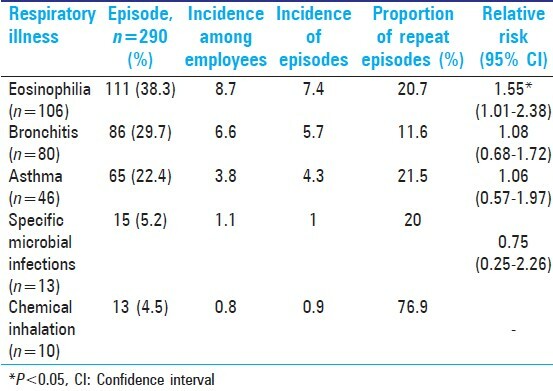 Incidence of episodes was 0.57% per year with every 11 th employee getting bronchitis again (proportion of repeat attack was 11.6%). When exposure to an occupational environment is considered, the risk (RR) came out to be 1.08 (0.68-1.72). Joshi et al.,  reported prevalence of chronic bronchitis in comparison with other surveys in their publication. Percentage prevalence of chronic bronchitis among adults more than 15 years of age in different parts of Europe and USA among variety of occupational groups ranged from 8-29.2% in urban areas and 9-22.1% in rural areas. Magnitude of bronchitis is quite low in present data set retrieved from a reputed fertilizer industry located in western part of India. Data of prevalence rate per 1,000 of the above mentioned study has been used to estimate the incidence, taking the duration of this condition in the range of 7-30 days. No pattern of age gradient was observed in present study similar to that reported in a paper referred earlier. Rahman et al.,  reported that higher levels of exposure to ammonia in the urea plant were associated with an increased prevalence of respiratory symptoms. Thus, ammonia being a respiratory irritant is responsible for a proportion of cases diagnosed as bronchitis in this industry, although AR for ammonia causing bronchitis was only 14% [Table 1] and [Table 2]. Ray et al.,  reported in their community-based study an incidence of pulmonary eosinophilia in the range of 2.7-4.1 per 1,000. This study calculated an incidence rate of 0.87 for pulmonary eosinophilia with statistically significant RR of 1.55 (1.01-2.38) when exposure to ammonia is considered; although, AR for ammonia for pulmonary eosinophilia here was 40%. Tropical pulmonary eosinophilia is usually seen in areas endemic for filariasis. It affects only a small proportion of the population at risk and microfilaria are rarely demonstrated in peripheral blood. Pulmonary eosinophilia is not uncommon in this community in which filariasis is endemic. Microfilaria rate in this region has been reported as 2.0%. It is likely that this incidence rate of pulmonary eosinophilia among employees may be contributed by endemicity of this region for lymphatic filariasis. RR of bronchial asthma 1.06 (0.57-1.97) and specific microbial infections 0.75 (0.25-2.26) were insignificant in view of exposure to ammonia. Incidence of chemical inhalation was less than 1% per year throughout the last decade. Results reflect the overall situation related to respiratory morbidity in the same industry. A study conducted in workers exposed to ammonia for 10-15 years at levels up to and exceeding 24 ppm did not find any adverse effects. The duration of study was 10 years with a total number of employees being 1,221; among which 68.2% were exposed 31.8% were spared from ammonia exposure; the average age of employees being 49.6 years although mean of the time duration they have been working with this company came out to be 24 years. The ratio of local to immigrant population in the study group was 2.4:1 with a turnover rate of less than 1% per year. The respiratory morbidity recorded in this industry does not seem to be related solely due to exposure to ammonia. Low RR and lower AR in relation to exposure to ammonia do not allow cause and effect relationship between exposure to ammonia and respiratory morbidity. 1. Kribhco Annual Report 2009-10. p. 11. 2. Silverman L, Whittenberger JL, Muller J. Physiological response of man to ammonia in low concentrations. J Ind Hyg Toxicol 1949;31:74-8. 3. Jacobs MB. Health aspects of air pollution from incinerators. American Society of Mechanical Engineers Committee. Proceedings of the National Incinerator Conference, New York, USA, 1964. 4. Friberg L. Absorption of and reaction to inhaled particles. Arch Environ Health 1965;10:168-74. 5. Joshi RC, Madan RN, Brash AA. Prevalence of chronic bronchitis in an industrial population in North India. Thorax 1975;30:61-7. 6. Rahman MH, Bråtveit M, Moen BE. Exposure to ammonia and acute respiratory effects in a urea fertilizer factory. Int J Occup Envion Health 2007;13:153-9. 7. Ray D, Abel R, Selvaraj KG. Epidemiology of pulonary eosinophilia in rural outh India: A prospective study, 1981-86. J Epidemiol Community Health 1993;47:469-74. 8. Mak JW. Antifilarial compounds in treatment and control of lymphatic filariasis. Trop Biomed 2004;21:27-38. 9. Swotinsky RB, Chase KH. Health effects of exposure to ammonia: Scant information. Am J Ind Med 1990;17:515-21. 10. Pyatt FB. Potential effects on human health of an ammonia rich atmospheric environment in an archaeologically important cave in southeast Asia. Occup Environ Med 2003;60:986-8.